The US is currently suffering its widest drought since 1956, according to data released by the National Oceanic and Atmospheric Administration (NOAA). On Monday, NOAA reported that by the end of June 55% of the continental US was in a moderate to extreme drought. 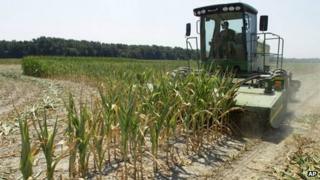 Crops including corn and soybeans have been hit by the dry conditions, and several states have seen wildfires. High temperatures across much of the country in June contributed to the spread of the drought. As much as 80% of the US is abnormally dry, the report said, noting that the drought expanded in the West, Great Plains and Midwest areas. June was the 14th warmest and 10th driest since records began, NOAA said. Agriculture officials estimated that 30% of the corn crops planted in the 18 high-production states were in poor or very poor condition by last week. Over 1,000 counties in 26 states have been declared disaster areas because of drought, according to the US Department of Agriculture. Earlier, NOAA said that the last year in the continental US has been the country's hottest since modern record-keeping began in 1895. Are you in the US? Have you been affected by the drought? Tell us your story using the form below.